Pioneering digital technologies from ABB are opening the door to autonomous shipping. Together, a dynamic positioning (DP) system that simplifies ship maneuvering and a situational awareness solution that provides real-time visualizations of a vessel’s surroundings create a powerful formula for enabling autonomous operations. Although crew sizes, especially in oceangoing cargo vessels, have decreased in recent decades, regulations call for at least one person to be on the bridge regardless of conditions. While this is very much justified in situations where a ship is approaching other ships or in areas where more traffic is anticipated, crossing an ocean in very good and clear conditions can lead to a situation where the Officer of the Watch (OOW) is on the bridge for an entire shift without touching any equipment or doing anything but looking at radar screens and outside the window to ensure that there are no threats. This can cause mental fatigue with an associated loss of alertness and can lead to a situation where a human reacts too late to an event that might otherwise have been anticipated earlier. Enabling a better quality of rest during good conditions when there is no need for major navigation actions has an impact on crew alertness and decreased fatigue when approaching coastal areas or routes that have traffic. In view of this, and with a focus on increasing the safety of navigation in areas where manned bridges are required, ABB has introduced ABB Ability™ Marine Pilot Vision and ABB Ability™ Marine Pilot Control. Together, these pioneering technologies provide bridge personnel with full 3D situational awareness and an intuitive environment designed to operate vessels in a safe and efficient manner. “This technology, which is already available, will act as a stepping stone into the future of autonomous shipping,” says Mikko Lepistö, Senior Vice President Digital Solutions at ABB Marine & Ports. 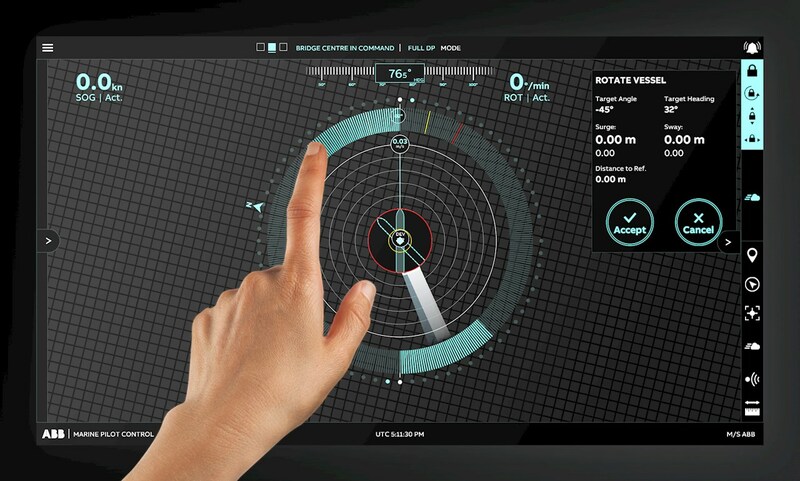 01 Marine Pilot Control utilizes a novel touchscreen interface. The interface accesses advanced algorithms that calculate the optimal execution of a bridge officer’s command in any operational situation. 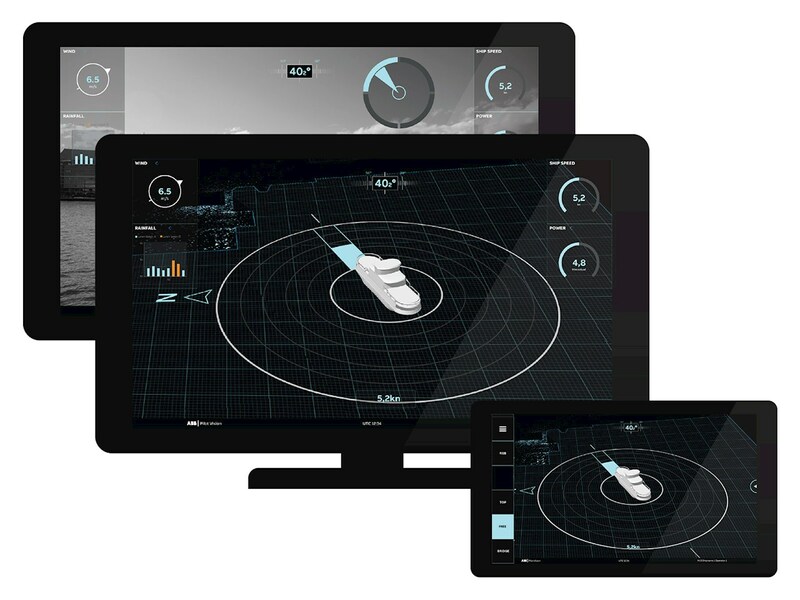 With its user-centric design, ABB AbilityTM Marine Pilot Control reduces the workload related to navigational tasks and allows bridge officers to focus holistically on a vessel’s overall control and positioning. The system integrates seamlessly with existing onboard equipment and ensures ease of installation and maintenance, adding significant “bridge-to-propeller” value for shipowners. One of the key benefits of the new system is that it allows the operator to switch to joystick control for maneuvering a vessel at any speed and all the way to docking. 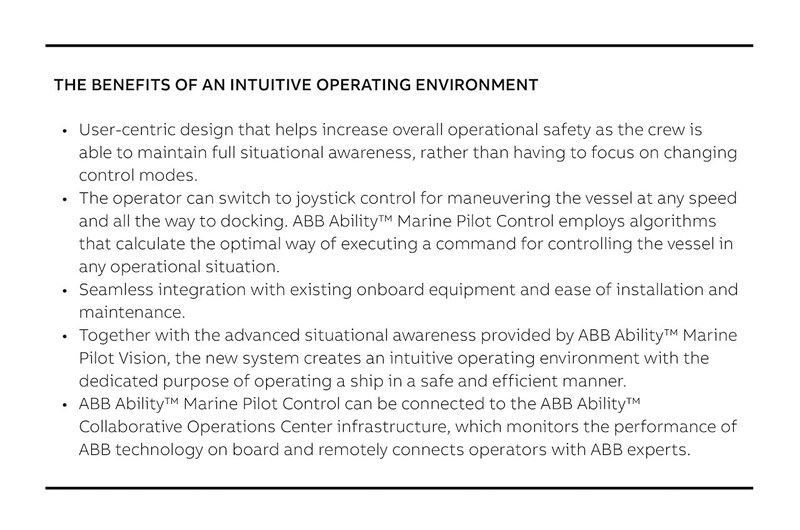 To accomplish this, ABB AbilityTM Marine Pilot Control employs algorithms that calculate the optimal way of executing a command for controlling a vessel in any operational situation. The overall safety of the operation is increased because the crew is able to maintain full situational awareness, rather than having to focus on changing control modes. 02 Marine Pilot Vision provides unparalleled situational awareness for ship crews with real time information presented in augmented reality and 3D virtual views around the vessel, allowing for perspectives that were not previously available. Unveiled at the SMM maritime trade fair in Hamburg, Germany, on September 5, 2018, ABB AbilityTM Marine Pilot Control has obtained Lloyd’s Register’s (LR) Approval in Principle (AiP) certificate. LR is a leading international provider of classification, compliance and consultancy services to the marine industry. “Lloyd’s Register is focused on supporting the introduction of new solutions to the shipping industry that enhance safer, more efficient and sustainable ship operations,” says David Barrow, Commercial Director, Marine & Offshore, Lloyd’s Register. ABB Ability™ Marine Pilot Vision takes advantage of the latest advances in sensor technology and computer vision to offer new ways of perceiving a vessel’s situation. A virtual model of the ship is superimposed on real surroundings, making it possible to see a vessel’s position and movements from a bird’s eye view perspective. Bridge personnel can switch between views instantaneously, making it easier to predict vessel motions and be alert to previously hidden obstacles or collision risks. The resulting improvement in situational awareness has significant benefits for safety and operational efficiency. “Computer vision has advanced significantly in recent years. With this new solution, ABB is leveraging it in order to present vessels in their environment in ways beyond ordinary perception. Crucially, we can do this in real-time in an intuitive fashion, which does not distract the crew from their work. In this sense, Ability™ Marine Pilot Vision extends the capabilities of the human senses,” said Lepistö.